If you’ve followed our other blogs, you know that until now our deployments of OpenStack have been limited, either by restricting the number of nodes, or by virtualizing the entire deployment. This series of blog posts will document our set up of a more realistic Cloud system using the OpenStack platform on Ubuntu 12.04 LTS. This post will focus on our configuration. Our setup has combined the Management and Data networks of this tutorial into one private network. For internet access before networking has been configured, we’ll be using a USB NIC for temporary access to our public network. When things are working though, our setup will look like it was described above. Lastly, chances are we’ll expand our storage cluster so that any node with sufficient HDD space will be given Cinder (block-storage) functionality. This won’t happen until our setup is functional though, so this is way down the line. Until the moment we have been researching possible solutions to make an OpenStack Cloud deployment have as much high availability features as possible. Before the Folsom release H.A features were not built in the OpenStack service components. With a large number of requests from the OpenStack community, starting with the Folsom release H.A is being addressed as part of the project. The features are still being introduced and in test phase, there aren’t a lot of production deployments out there yet, but with the help and feedback of the community the OpenStack developers believe that by the time the next version is release (Grizzly) OpenStack H.A features will be automated and ready to get in production mode from the get go. Instead of reinventing the wheel, OpenStack decided to go with a proven and robust H.A provider available in the market: Pacemaker was their choice. With more than half a decade of production deployments, Pacemaker is a proven solution when it comes to providing H.A features to a vast range of services. Data loss — the accidental deletion or destruction of data. In the end the focus is to eliminate Single Points of Failures in the cluster architecture. Redundancy of facility services such as power, air conditioning, fire protection, and others. Pacemaker relies on the Corosync project for reliable cluster communications. Corosync implements the Totem single-ring ordering and membership protocol and provides UDP and InfiniBand based messaging, quorum, and cluster membership to Pacemaker. An OpenStack high-availability configuration uses existing native Pacemaker RAs (such as those managing MySQL databases or virtual IP addresses), existing third-party RAs (such as for RabbitMQ), and native OpenStack RAs (such as those managing the OpenStack Identity and Image Services). 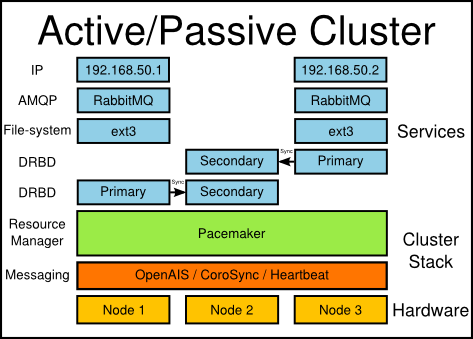 PaceMaker creates a cluster of nodes and uses Corosync to establish a communication between them. managing all resources, including the MySQL daemon itself, with the Pacemaker cluster manager. volume controller, network controller, and object store (or image service). controller, and volume controller via AMQP (Advanced Message Queue Protocol). - Represents the global state and interacts with all other components. * Console services to allow end users to access their virtual instance's console through proxy. - [storage repo] stores actual image files. - [replication services] ensures consistency and availability through the cluster. - [cinder-scheduler] picks the optimal block storage provider node to create the volume on. Bad floatingip request: Cannot create floating IP and bind it to Port ......., since that port is owned by a different tenant. The problem was using the Controller Node to run the command, without properly re-sourcing the environmental variables involved. To do this, I needed to change the [novarc] file the tutorial had me create when I set up the Controller Node. agents interact with the main [quantum-server] process through Remote Procedure Calls(RPC), with RabbitMQ or qpid, OR through standard Quantum API. Quantum relies on Keystone for authentication and authorization of all API requests. Nova interacts w/ Quantum through its API. – In simple deployments, the Controller Node and Network Node can be combined.